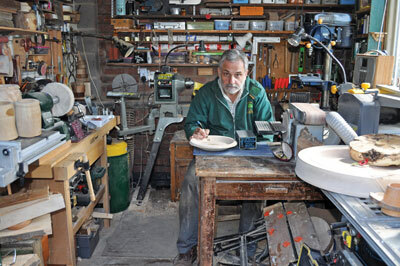 Steve Fearnley has been woodturning for some years now, since 2009. 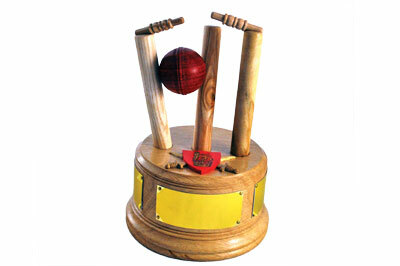 Steve produces a variety of items ranging from household goods and ornaments to clocks and trophies. He also runs his own website; www.oldfern.co.uk. How, when and why did you start turning? 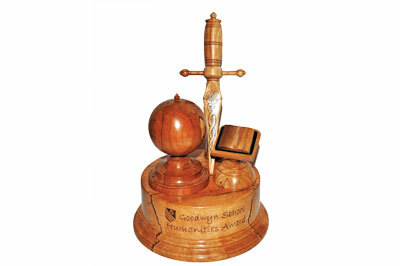 I had been making trophies for a couple of years for the school I worked at and thought I could do a better job with a lathe. My dad used to turn and I have made things out of wood most of my life. I bought a small lathe for Christmas and spent the festive holiday getting nowhere, until I went to a beginners’ night in January, after which I was up and running. What and who are the greatest influences in your work? I owe virtually all my progress to Snainton Woodworking Supplies, near Scarborough. I was invited to beginners’ nights every Wednesday – free because I bought a lathe from them – and never looked back. Graham and Sue Harker guided me through the key techniques and there isn’t much that Rob Thompson doesn’t know about timber and turning. 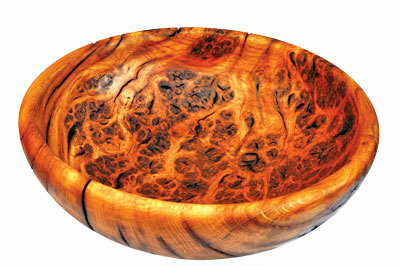 Snainton Woodturning Club then enhanced everything with their monthly club nights with top class demonstrators. The best advice I could give any ‘would-be’ woodturner is get some tuition and guidance, and join a club. You cannot have too much advice – you don’t have to act on it all and it will be conflicting at times from different people. You just have to make up your mind about which to take. I enjoy live music. My wife and I have been to the Perthshire Amber festival for the last few years. Dougie MacLean and Eddi Reader are firm favourites. Closer to home we enjoy Kate Rusby’s concerts, especially the Christmas specials. We also fulfilled a lifetime ambition when we saw Leonard Cohen perform live at Leeds Arena a couple of years ago. I haven’t read much recently. I like biographies – the last book I read was a biography of Leeds Rugby League great John Holmes. I started stripping down my Nova lathe because it suddenly lost power. I was close to taking off the headstock to return it to my supplier, but then common-sense prevailed – it always pays to start with the most obvious problem, such as the 3-pin plug working loose in the extension socket. 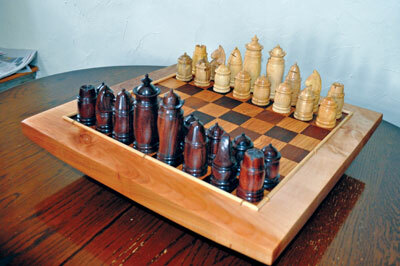 The most challenging, but also most interesting piece I have turned was a full chess set and board, based on a 125mm-high king and 50mm-wide chessboard squares.As with most of my work, it was a commission. I experimented with different wood before settling on rosewood (Dalbergia latifolia) and box (Cornus florida) and particularly enjoyed the challenge of carving four knights on top of their turned bases, not having done much carving before. 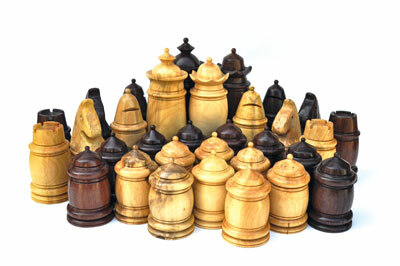 Making 16 identical pawns, four rooks and bishops, and two kings and queens required some thinking about design and technique. I settled on using a beading tool to create two measured beads on each piece, one at the bottom and one near the top. All that was needed then was to shape the space between them and turn the top. As a maths teacher I came across a mathematical solid known as a Klein bottle. This is a solid ‘bottle’, but it only has one side; its inside is also its outside and it has no boundaries. I am sure I can turn one, probably involving segmented turning techniques… one day. I usually work on a handful of pieces at a time. One currently on the go is a 610mm diameter sycamore (Acer pseudoplatanus) memorial plaque. 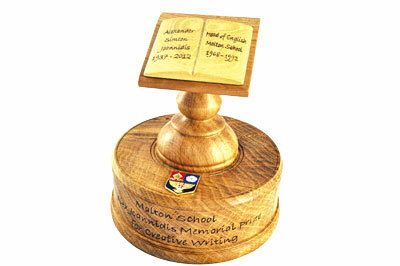 The disc is turned, it now needs pyrographing with the names of those students and staff from where I used to teach – Malton School – who gave their lives in both World Wars. Apart from the obvious lathe, gouges and chisels, I would not be without my Peter Child pyrography kit. When I first started turning trophies, getting lettering on them involved either fixing metal plates, or using computer-generated vinyl transfer lettering. Both of these required work by another person, so the piece was not entirely my creation. Nowadays I transfer computer generated mirror-image designs from an ordinary inkjet printout rubbed on to the wood, then pyrograph over this outline. I am not sure about changing one thing. I like to think that things happen as they happen, and they are as they are. It doesn’t pay to be thinking what might have been, if only something else had happened. I am happy doing all types of turning, whatever is required by a particular request. Left to my own devices with no requirement to sell a piece or fulfil a commission I would probably mainly turn bowls – I love the endless variety of such a basic shape and the subtle effects that very minor changes in shape can have. Wishes are for magical things, aren’t they? I wish woodturning and sanding didn’t produce dust. I think I might like a vacuum chuck, but never having used one I don’t know if one would be a good investment. Finding ways of holding pieces while turning is all part of the fun, but a vacuum chuck might allow designs that would otherwise not be possible. 5. Throwing anything away. I use any pieces of wood that are viable, if not they are put on the wood burner as kindling or fuel. Shavings and sawdust are all put on the compost heap and mixed with grass clippings. The downside is finding places to keep everything until a use occurs! 3. 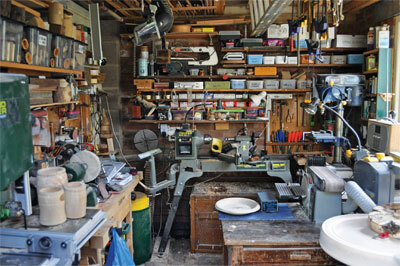 It pays to keep your workshop tidy; a place for everything and everything in its place. If only I could follow this advice!